With the big Welterweight showdown between Amir Khan (33-4, 20 KOs) and Terence Crawford (34-0, 25 KOs) less than one month away, both fighters joined a conference call to discuss several topics including how their preparation for the fight has been going and just how important this fight is for their respective careers. Promoter Bob Arum also chimed in on why he feels as though this will be a compelling matchup as well. For Crawford he will be looking to defend his WBO Welterweight title for the second time. Amir Khan will at least on paper pose the biggest threat to his current title reign. Crawford fully understands the risk that Khan presents. Crawford is widely regarded as one of the best fighters in the world. At this stage in his career a loss would be devastating. That sense of urgency helps fuel Crawford to not allow such upsets to occur. Sure Crawford has praised Khan and his abilities while acknowledging the threat that he is. However, Crawford is not short on confidence. Whenever Crawford is in the presence of the media there is a major elephant in the room. The name of that elephant would be Errol Spence Jr. When asked if he believes that the fight can happen and how big it is Crawford did not mince words. Fans all around the world would agree with those sentiments. A Spence vs Crawford showdown is huge. The talks surrounding those two fighters are getting louder and louder. Khan hears the chatter and offered his warning to Crawford. “There is a lot of talk of Crawford fighting Spence but he’s got his hands full against me. If he’s overlooking me he’s going to have a big shock. I hope he’s going to be ready in this fight,” said Khan. Say what you what about Khan but he is right. If Crawford comes into this fight not fully focused then he could be in for a rude awakening. When Khan was last seen he was picking himself up off the deck against journeyman Samuel Vargas. It was a fight that Khan ultimately won but he did not look sharp. Fans shouldn’t worry. Khan has repeatedly raised his game to the level of his competition. The better the opponent the better he performs. That in part is one of the reasons why Bob Arum choose Khan as an opponent for Crawford. “I have always been an amir khan fan. I’ve been around over 50 years so I know what makes a good fight. 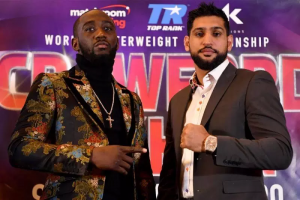 Khan vs Crawford is a hugely competitive fight. Styles make fights,” said Arum. With all of the talk between these two fighters the anticipation for the matchup is building. April 20th couldn’t get here fast enough.